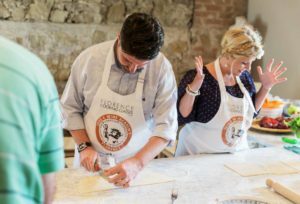 What better way to improve relations between your team than with some great wine and good food on a wine tasting team building trip? Here at Grape Escapes, our expertise lies in organising unforgettable corporate trips. We will take care of the smooth-running of the entire event including your travel, your accommodation and most importantly, your memorable wine tasting team building itinerary! All of our corporate itineraries are completely bespoke and tailored entirely to your requirements, however we have listed below some of our favourite unusual wine tasting team building activities, depending on your budget. 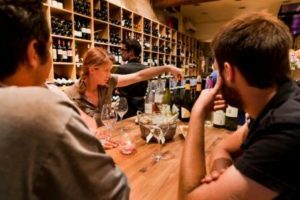 To see exactly how a Grape Escapes wine tasting team building trip would pan out from start to finish, have a look at our sample itinerary for a Team Building trip to Provence. 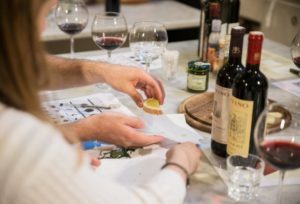 Bordeaux Wine and Cheese Workshop: This mouth-watering and insightful wine tasting team building activity takes place at a Grand Cru Classé Château in Bordeaux. Following a private guided tour of the breathtaking estate and cellars, you will taste three of the Château’s wines, perfectly paired with a selection of local cheeses. 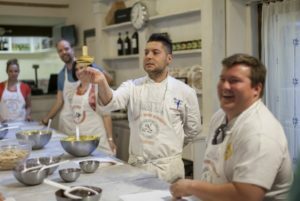 Traditional Tuscan Cookery Class: A local Chef will take you to the market to select products and will then take you to a great cooking location to teach you about Italian cuisine. Why not split into teams for some friendly competition? You will then taste the fruits of your labour together over a convivial lunch. Go-Karting: A great idea for a team building event, this activity includes 10 minutes of timed practice (qualifying to set grid positions) then a 20 minute race with a glass of Champagne for each group member and medals for the top three placed karts. Gourmet River Cruise in Bordeaux: A unique way to discover Bordeaux! On this guided river cruise, you will be taken along the port whilst learning about the city’s maritime past and the history of the thriving wine trade. A fantastic three course lunch with drinks will be served on board. 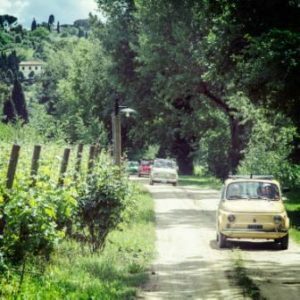 Sunset Barbecue in the Chianti Vineyards: Enjoy an enchanting evening in the Chianti vineyards, starting with a visit of an authentic Tuscan winery, followed by a wine tasting. You will then discover the farm’s historic chapel. A mouth-watering traditional Tuscan barbecue, accompanied by music will be waiting for you at the end of the tour. 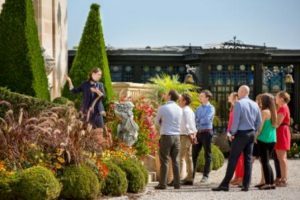 Dine in the cellars of a world-famous Champagne House: The highlight of any luxurious team building trip to Champagne would be a VIP visit at one of the region’s large, prestigious Champagne Houses, such as Moët and Chandon, Taittinger or Veuve Clicquot. 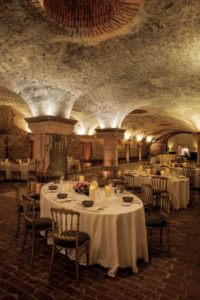 As well as having a behind-the-scenes tour of the magnificent, impressive cellars, a gala dinner will be served, alongside a selection of Champagnes from the estate. Why not enjoy a spot on dancing after dinner with a DJ, or we can even arrange for you to be entertained throughout the meal by CanCan dancers, mime artists or a traditional French accordionist. Give us a call on +44 (0) 1920 46 86 66 or e-mail info@grapeescapes.net to start planning your wine tasting team building trip with our team of experts.